Well, we’ve been talking so much about back to school lunches, I almost forgot about the whole ‘what’s a quick and easy breakfast option that I can grab ‘n go’ concept! BECAUSE WE ALL HAVE THOSE MORNINGS. I try to get everyone up 15 minutes earlier than I think we need to get up, in order to just get through the morning routine. I don’t like the frenzy that happens with the ‘get your backpack,’ ‘where are your glasses?’ that inevitably happens…despite my best intentions and organization. 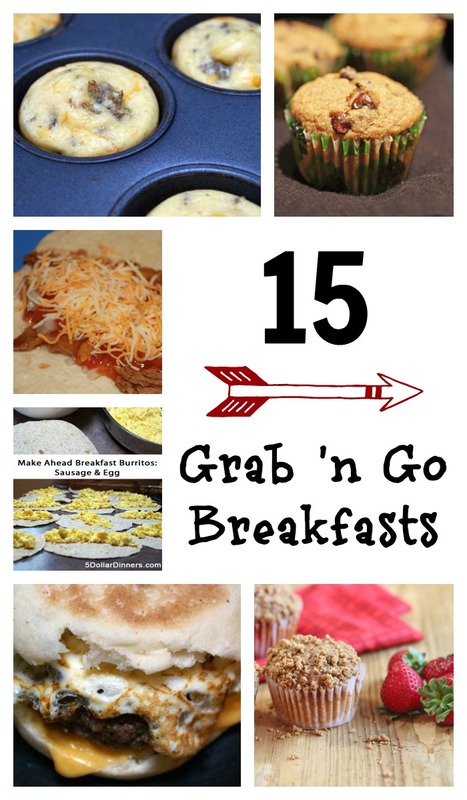 What are your favorite grab n go breakfasts?! Need more freezer friendly breakfast ideas? Be sure to check out our meal plan for 85 Make Ahead and Freezer Friendly Breakfasts & Snacks for only $140! You may want to delete one of the comments from the Sausage Eggwich post, it includes a link claiming a quick easy microwave version. The link takes you to a pornographic website. Thank you for letting us know. It’s been removed! I spent an hour yesterday with 3 dozen eggs, half a bag of shredded cheese, a pound of sausage, fajita wraps and english muffins and made 32 breakfast burritos, 6 egg mcmuffins, and 12 hard boiled eggs (my kids like those for quick snacks) – they pack their breakfast and eat it at school with the other students. Great time saver! I can’t wait to stock up on muffins as well. BTW, our family’s way out of the Morning Frenzy–I set a daily alarm for 15 minutes before the bus arrives (or the car leaves). It goes off, I (or whichever kid is closest) hit the snooze and holler “Ten minute warning!”–that’s the cue for shoes, coats, backpacks, all the “get ready” stuff to happen. When it goes off the second time, we know we have to step out of the door to make the bus. It takes ME out of the equation in terms of getting people moving, and places it on the clock and each individual. I’ve done this since my kids were 3 or so, and even then they got it and figured out quickly what it meant, although I still had to do most of the “doing” to get them out the door. I make Herbal life shakes w/ fruits & nuts/ seeds and sometimes Oatmeal the night before. I just grab it and it gives me a few extra minutes I can use to check my emails. The bonus is that it is nice and cold instead of on the room temp side from being blended. I have a hectic schedule and can also grab this between appointments.